We’ll stick with the Christmas gift theme and talk about buying a wooden jewelry box: an obvious question is design - traditional, modern, or deco? Traditional jewelry boxes are the most popular, as their colors are more subdued and the designs have stood the test of time; they won’t go “out of style”. Traditional designs are noted for the wood texture, paint color, and shape of the legs, in the case of standing armoires. Wood texture is normally distressed to show age, but not appear worn out. Paint color is muted: darker tones, single color, staining rather than actual painting, though any painting that is not natural too wood is normally single-coated, with the underlying wood grain showing through a thin layer. 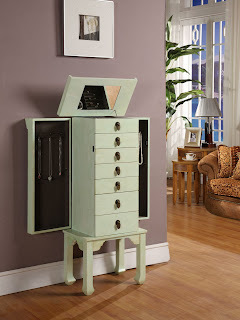 (Check out the picture of the Ningbo Chinese style, in rustic green, for a great example of this.) Designs are prevalent as well, artistic criss-cross patterns along the top being widely used. Leg patterns are almost always curved. Modern styles tend to have straight legs, are highly polished and smooth, and are built to have the wood grains line up. In luxury wooden jewelry boxes, a sign of excellent craftsmanship is how well the grains align. Modern wooden jewelry box styles generally eschew extravagant designs and are normally blocked at the top and side. Wood grains are exotic, such as bubinga. Deco styles may be considered to be ultra-modern, with the paradox of being recreations of the art deco of the 20s, a purported throw-back but a nod to ultra-modern anyway. These are almost always smooth, highly polished, wood grain covered by coats of paint, and, in may cases, multi-colored. These are also very beautiful, though may not go with traditional furniture. So when you look to buy a wooden jewelry box, and are trying to decide on design, traditional is the safest bet, modern can fit almost all decors except the most antique-looking, and deco is great for the most modern bedrooms!